Immediately upon hearing of Manzoor Ahmed's arrest the international campaign took off, with pickets, phone calls and letters of protest to the Pakistani embassies. Here we publish a sample selection of activities, to provide a taste of what was done in the campaign. We thank all the comrades for the tremendous response. Immediately upon hearing of Manzoor Ahmed's arrest the international campaign took off, with pickets, phone calls and letters of protest to the Pakistani embassies in countries such as the USA, Spain, Austria, Germany, France, etc. Here we publish a sample selection of activities we have received reports of, to provide a taste of what was done in the campaign. We thank all the comrades for the tremendous response. Simona Bolelli, Alessandro Giardiello, Mario Iavazzi, and Jacopo Renda, members of the National Political Committee of the Partito della Rifondazione Comunista. Stefano Alberione, member of the presidency of the National Control Commission, Prc. The comrades also raised the issue at the big demonstration in Genoa on Saturday that was organised to demand justice for the killing of Carlo Giuliani by the police in the anti-G8 demo in 2001. Os trabalhadores ferroviários do Brasil representados pela Federação nacional Independente dos Trabalhadores Sobre Trilhos - CUT, reporta-se à V.Sa para solicitar a liberdade do Deputado Manzoor Ahmed e dos demais integrantes da Longa Marcha, presos na manhã de 16 de Novembro de 2007 na cidade de Gujranwala. Somente o restabelecimento das liberdades democráticas podem fazer com que o país volte a normalidade e o povo paquistanês possa encontrar a resolução para os problemas que afligem o país. Prezado Senhor, venho através desta solicitar a liberdade do Deputado Manzoor Ahmed e dos demais integrantes da Longa Marcha, presos na manhã de 16 de Novembro de 2007 na cidade de Gujranwala. 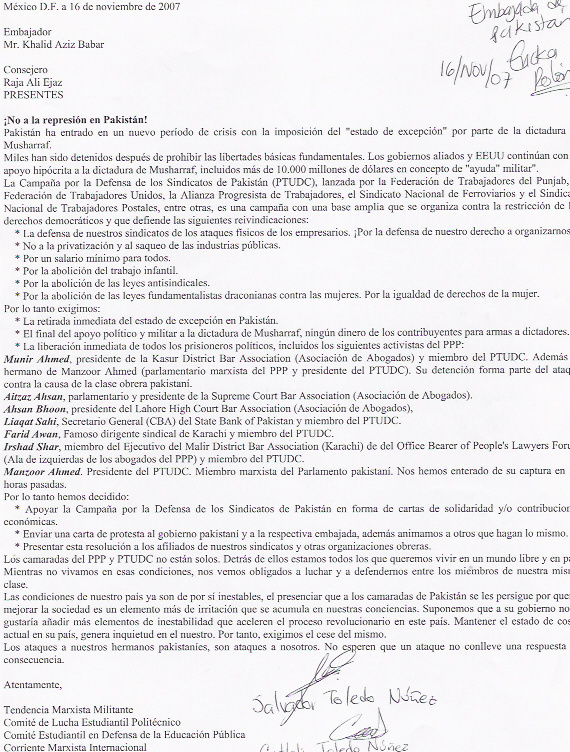 As soon as comrades in Mexico of the Marxist tendency Militante heard of the arrest of Manzoor they set about organising a picket, which took place on November 16th at 3 pm (Mexican time), with about 30 people picketing the Pakistani embassy in Mexico City. A delegation met the ambassador (although he refused to speak to them in Spanish) and handed him a protest letter. Delegates to this year's Labour Representation Committee (LRC) conference held in London on Saturday, Novembere 17, gave unanimous support to a resolution moved by Socialist Appeal on the declaration of martial law by Musharraf in Pakistan. The resolution attacked the calling of the so-called state of emergency and demanded the release of all those arrested under the measures. In moving the resolution, it was made clear that the trade union movement has been particularly targeted by the regime in response to the recent wave of industrial action to hit Pakistan. It was also made clear from the platform that a message of support for PTUDC president Cde Manzoor, who was the guest international speaker at last year's LRC conference, would be sent and that his immediate release from detention would be demanded. In opening the international session of conference, Jeremy Corbyn MP also made reference to the need to protest against the state of emergency. Over 250 delegates and visitors attended what was one of the main gatherings of the left inside the Labour Party during the year. "I have just retired as a teacher after 35 years in the profession. For the past 40 years I have lived in Coventry and for the whole of that time I have worked with communities from India, Pakistan and Bangladesh fighting against racism and prejudice and for human rights and equality in society for all. "Now I find that the government in Pakistan, far from guaranteeing human rights for its own citizens, carries out a whole series of arrests of its own citizens who have done nothing more than seek to express their civil liberties through freedom of speech and the right to march and demonstrate. "Such actions on the part of the Pakistani government do nothing to challenge those in British society who would wish to see Pakiatani people in the UK treated as second class citizens. "Through you, High Commisioner, I call upon the Pakistani government to immediately release Mansoor Ahmed MP and other members of the PTUDC arrested in Gujranwala, Pakistan. The question of Manzoor's arrest was taken up by Iranian comrades of the Militaant (Iran) as can be seen here (in farsi). In Greece immediately upon hearing of the arrest of Manzoor, comrades from three different towns telephoned the Pakistani Embassy and spoke to the ambassador in the name of the "National Committee of Trade Unionist and Members of the Left for the Release of Manzoor and all political prisoners of Pakistan". We told him that we demanded the immediate release of Manzoor, otherwise we would organise big protests outside of the Embassy next week. He told us that he would send a written message on this protest to the Pakistani authorities today. We are continuing the campaign in the schools and in the Unions. And that, US and allied governments continue their hypocritical support of the Musharraf dictatorship, including up to $10-billion in military "aid,"
1) Defence of our trade unions from the physical attacks of the employers. Defend our right to organise! 2) Stop the privatisation and plunder of state industries. 3) For a minimum wage for all. 4) The abolition of child labour. 5) The abolition of anti trade union laws. 6) The abolition of draconian fundamentalist laws against women. Equal rights for women. 3) The immediate release of all political prisoners, the PTUDC members arrested, the lawyers and judges that have been arrested because of their refusal to legalize the dictator and all the left-wing and democratic activists. Solidarity to the people of Pakistan against the dictatorship! It is important to note that in all cases it was voted in mass assemblies of student unions (150-300 attendants). It is also going to be voted in more student Unions in the next few days. In Belgium the resolution below was voted at the Sunday performance of Hei Pasoep, after several of the group's members had already asked about the situation in Pakistan and the PTUDC comrades in particular. This was sent to the Pakistan embassy in Brussels. The solidarity choir Hei Pasoep has heard of the arrest of Manzoor Ahmed, MP for the PPP and chairman of the PTUDC. He has been arrested for political reasons by the Pakistan authorities. Hei Pasoep knows Manzoor Ahmed personally from a joint relief campaign for Kashmir. We follow carefully the events in Pakistan, in particular the installation of a state of emergency by the government of General Musharraf. We strongly condemn the arrests this involves. We demand from the government of Pakistan a safety guarantee for Manzoor Ahmed and his immediate release together with the arrested activists of the PTUDC and of the PPP. We ask the government of Pakistan to stop the state of emergency and to give everyone the liberty to enjoy his/her democratic rights. Hei Pasoep is a choir known for its solidarity work, for example against the apartheid regime in South Africa. We have more than 100 members, including members of social movements, teachers, members of political parties and people in public office. If the government of Pakistan persists in its measures, we will further use our position to denounce these acts. "I called the embassy here in NZ about Manzoor. They connected me with the High Commissioner and he said he was unaware of Manzoor Ahmed being held. He said that the National Assembly is dissolved every five years for new elections and Manzoor is not a Member of the National Assembly anymore! He said that there were protests earlier this year and that a bomb went off and killed 150 people and so that precautions are taken and sometimes they "make mistakes". He said that he was not aware that anyone from the National Assembly was being held but that he would look into it and see what might be going on. He also said that chances are he will be released in the next few days if he is in fact being held as I assured him that he was not doing anything wrong in demonstrating. He said something about "taking precautions" due to terrorist activity and when I asked him who the terrorists were, he said Al-Qaeda and that if they don't take precautions then they would run "Scott free". I agreed that mistakes can be made but assured him that Manzoor was certainly not a terrorist and that he is standing up for democracy, human rights and the Pakistan workers' trade unions. He said that he would find out more information as he was not made aware of any of these goings on."